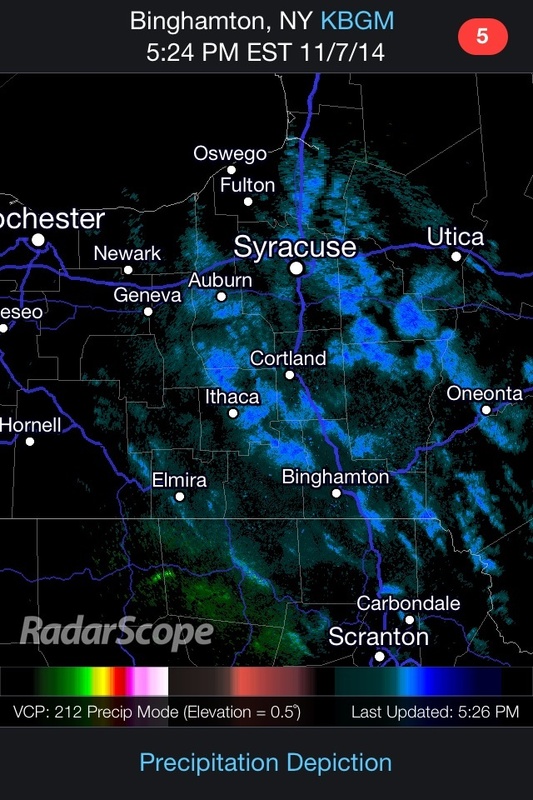 5:24pm Radar shows scattered flurries and squalls across the eastern Finger Lakes. Click to enlarge. Lake effect snow will continue this evening across the eastern Finger Lakes as cold northwest winds blow over Lake Ontario. These lake effect snow showers are rather cellular in nature, as is often the case with early-season lake effect snow. As a result, the snow will come and go for any one location, but when it does come down, it will come down at a decent rate. As temperatures continue to fall, the snow will start to stick to the road. With the on and off nature of the snow, travel conditions will change rapidly. Given that it is also dark now and that this is the first winter road conditions of the season, and it will be a good idea to use some extra caution, slow down and remember winter driving safety. The lake effect snows will start to diminish later this evening, and after midnight, there should be little to no snow falling in the area. Some places may see another inch or slightly more, especially at higher elevations. 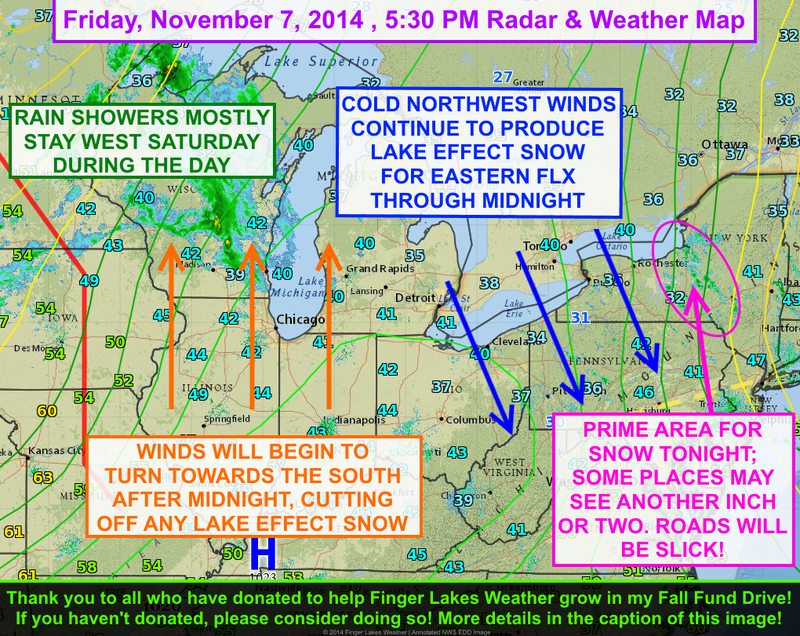 The rest of the Finger Lakes will be quiet tonight with little to no precipitation. Lows will be in the upper 20s region wide. Lake effect snow will continue to impact the eastern Finger Lakes this evening before winds shift and cut the snow off. Click to enlarge. 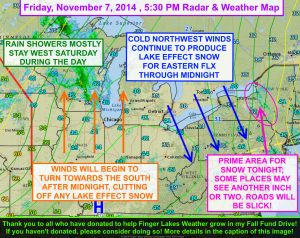 Please click the image at the top of this post to make a donation to FLX Weather for the Fall Fund Drive! The snow will end because of a significant wind shift from the northwest to the south as high pressure moves across the Ohio Valley and into the Mid Atlantic. These southerly winds are being enhanced by a storm system over the Mid West. This system will bring us more clouds tomorrow and a few light showers, mostly for the northwestern part of the Finger Lakes. For the most part though, Saturday will be pretty quiet. Showers will be more likely overnight Saturday and maybe on Sunday a little as well. We warm back into the 50s on Monday before cold air moves in and stays put for the rest of next week.